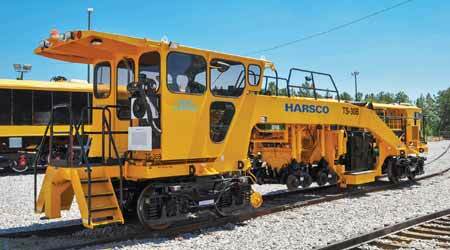 Harsco Rail’s Track Stabilizer, Model TS-30, stabilizes the track through inserting controlled, accurate force directly into the track structure. The BTE-450 Hi-Rail Backhoe, which can be used to tackle an array of track maintenance and repair projects, features a long reach extend-a-hoe and a hose reel to power hydraulic hand tools. Ballast Tools Equipment (BTE) engineers railroad track maintenance equipment, hi-rail machines and versatile attachments. BTE’s fleet of hi-rail machines can quickly hi-rail to a jobsite and perform spot maintenance or rail travel to difficult places, and easily tamp track, mud spots, diamonds and switches, the company said in an email. BTE hi-rail machines feature either a two- or four-motor tamper. 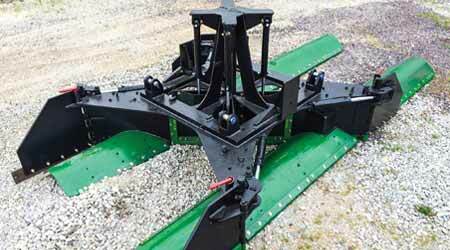 “The stick-mounted Rototilt provides excellent versatility, as you can rotate and tilt the tamper into many tight or difficult tie positions without moving the base machine,” said Regional Sales Manager Steve Whittington. Meanwhile, BTE’s hi-rail backhoes add “productive versatility,” the company said. Machine-mounted hydraulic hose reels power auxiliary tools, and the extend-a-hoe provides extra reach. 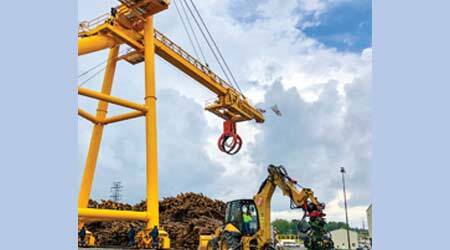 “Our machines are able to reach more than 20 feet to tamp a switch while the machine stays in a safe position, and then provide hydraulic power for hand tools to complete the job,” commented Whittington. Attachments for the company’s hi-rail excavators and backhoes include undercutters, mulchers, tampers, tie handlers, culvert cleaners and snow blowers. To that end, the company’s Track Stabilizer, Model TS-30, is designed to increase the longevity of track balance by stabilizing the track through inserting controlled and accurate force directly into the track structure. The operator can set the desired down-feed pressure for each rail and the machine maintains that constant pressure until the operator changes it. The TS-30’s workhead produces a horizontal force of 50 tons at 45 Hz and a vertical down force of 50,000 pounds. The Jupiter control system provides diagnostic capabilities, which minimizes trouble-shooting time. It also is equipped with pre- and post-crosslevel data collection. 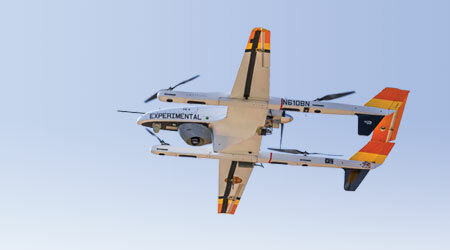 Additionally, the TS-30 is engineered with “large, comfortable control cabs that are fully enclosed, and climatized with excellent track visibility,” the company said, adding that the cab is accessible from either side of the machine via a rear platform and rear entry door. Ballast Tools Inc. can supply new or refurbish complete X-Plows (shown) featuring Tungsten Carbide upgraded hinge protectors, center post plates and tunnel wear bars. Ballast Tools Inc. (BTI) offers an array of “ground-engaging parts” designed to provide increased wear resistance and improved performance, the company said in an email. For example, New Arrow tamping tools for 09-3X continuous action tampers feature an “innovative design for improved tool life,” the company said. BTI also offers Tungsten Carbide-protected parts to reduce maintenance for many track maintenance ground-engaging machines, including the wear strips on undercutter bars, tie fingers, skids, wear plates and adzer bits. To protect ballast regulators from wear, the company offers Z-bars, TuffCarb plow blades, and extended life broom elements. BTI can supply new or can refurbish complete X-Plows featuring Tungsten Carbide upgraded hinge protectors, center post plates and tunnel wear bars. The new heavy-duty BTI ballast regulator baffle was developed due to customer demand for longer life and fewer change-outs compared with “the standard available product,” the company said. Ballast regulator baffle options include the “skeleton style” and the integral tail housing and baffle combination with a streamlined design, which eliminates obstructions and allows ballast to flow properly. Both designs are constructed of a harder, thicker wear-resistant plate to increase the baffle life, the company said. The Unimat 09-32/4S DYNAMIC Tamper. The main task of tamping machines is to produce quality track geometry under the most varied conditions. “Due to the vibration produced at the tamping unit the measuring systems used must both be sensitive and robust,” Plasser American Corp. officials said in an email. Apart from lifting and lining track, the actual tamping process is crucial when it comes to correcting the track geometry. 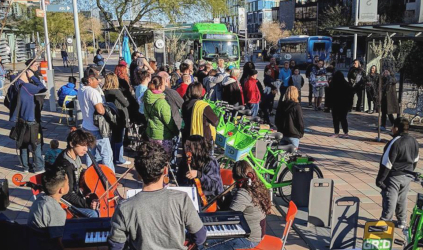 Key to success, then, isn’t just the amplitude and frequency applied — it’s also “the squeeze force exerted,” the company said. 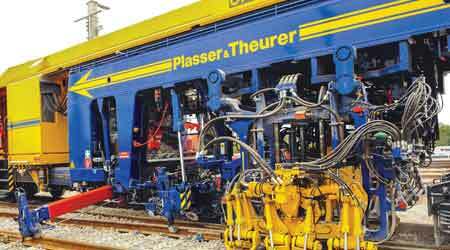 “To ensure a high consolidation of the ballast bed, the amplitude at the front edge of the tamping tool must be between 4 mm and 6 mm,” Plasser officials said. “Smaller amplitudes result in a reduced consolidation of the ballast bed. As a result, subsequent traffic will cause deeper settlements of the ballast bed. At this frequency, ballast is elasto-liquid. In this partly liquefied state, the correct track geometry quality of the ballast bed can be optimally achieved and preserved, the company said. The new “frequency modulation” technique — developed by Plasser — enables controlling the tamping vibration frequency precisely. For those reasons, 35 Hz is defined as squeezing frequency. “What is new is a higher frequency when penetrating the ballast bed,” the company said. Machines fitted with frequency modulation use 45 Hz and enable a reduction of the forces exerted and allow minimizing the wear on the tamping tools. When the tamping tools have been raised, they vibrate at an idling frequency of 28 Hz, resulting in less wear on the tamping unit and reduced noise emissions, the company said. Progress Rail released a new brushcutter attachment that can be adapted for its Kershaw Model 60 Ballast Regulator to address vegetation management. To simplify and improve operator interaction with major systems, Progress Rail recently implemented the integration of microprocessor control systems into all of its Kershaw Ballast Regulators. All operator control functions, machine status indicators, engine display parameters and engine codes now are displayed on a 12-inch, industrial touchscreen monitor. The company also recently released a new brushcutter attachment that can be adapted for its Kershaw Model 60 Ballast Regulator to address vegetation management. 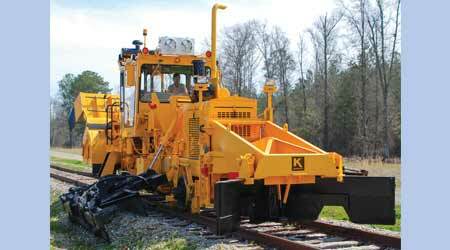 For winter months, Progress Rail offers attachments to convert the Kershaw Ballast Regulator into a snow removal machine. “Having multiple attachment options provides customers increased flexibility by improving their ability to utilize their equipment for multiple jobs as required,” the company said. Email comments or questions to prograil@tradepress.com.